Traditional Oatcakes excellent with Cheese. Oatcakes with added Laverbread, a typical traditional Welsh ingredient. 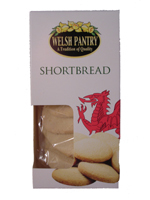 Our Oatcakes are delicious with cheese, even more so with cheese added to the biscuits! A carton containing a sealed packet of buttery shortbread rounds. 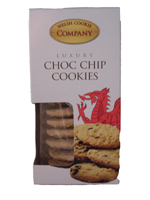 A carton of Choc Chip Shortbread rounds. Drum containing a sealed packet of wrapped cream fudge pieces.